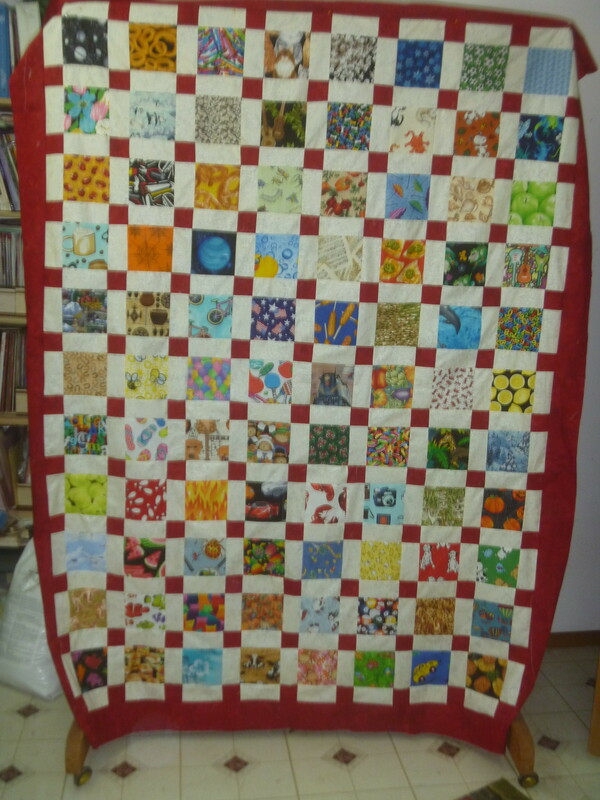 After 3 intensive cutting and sewing sessions, this “I Spy” quilt top has been finished. I won’t be doing much sewing until mid July. The rest of this week, I’ll spend in the greenhouse, garden and getting ready for a 3 day spinning retreat starting Sunday. My Fitbit is very unhappy about all this sewing because it has had a difficult time getting 5000 steps registered and it knows it is supposed to register 10,000. 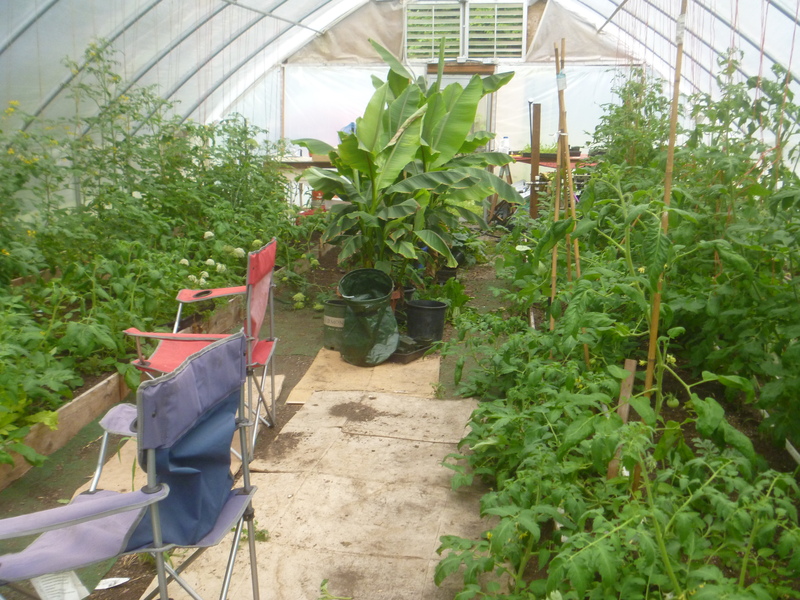 The garden has been left to go wild – but has had rain and the greenhouse was watered by my husband. So now it is time for a bit of catch up. Look how pretty her front yard is. 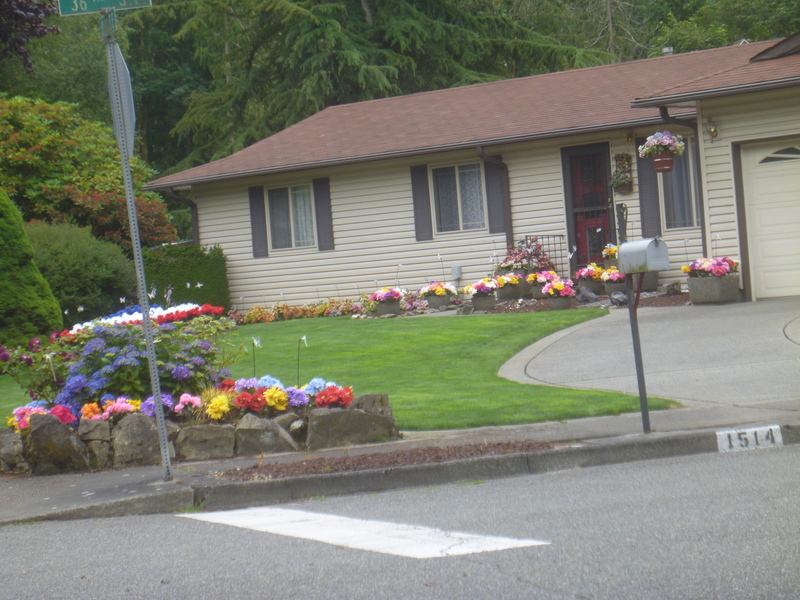 We drive by this house each time we go into town. I finally remembered to snap a photo as we were coming home yesterday. It has been a gloomy day outside. What better way to cheer up than working with pretty prints. So, I pulled these off the board in order of sewing, trying to carefully arrange them so that the pieces would all end up right side facing up (that didn’t happen and yes, the seam ripper came in handy). So now I have sets of three. which I sewed together to make 9 patches. I carefully cut those in half each way. Then turned 3 of the quarters around until this pattern emerged. 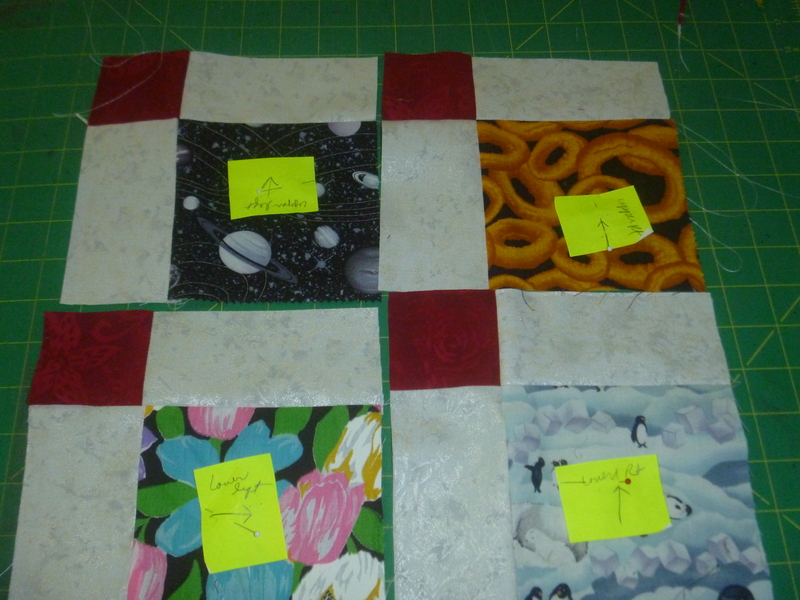 Now I will sew them into rows to make the quilt that I am aiming for. I have been buying venison scraps and bones for the dogs for the past two years. 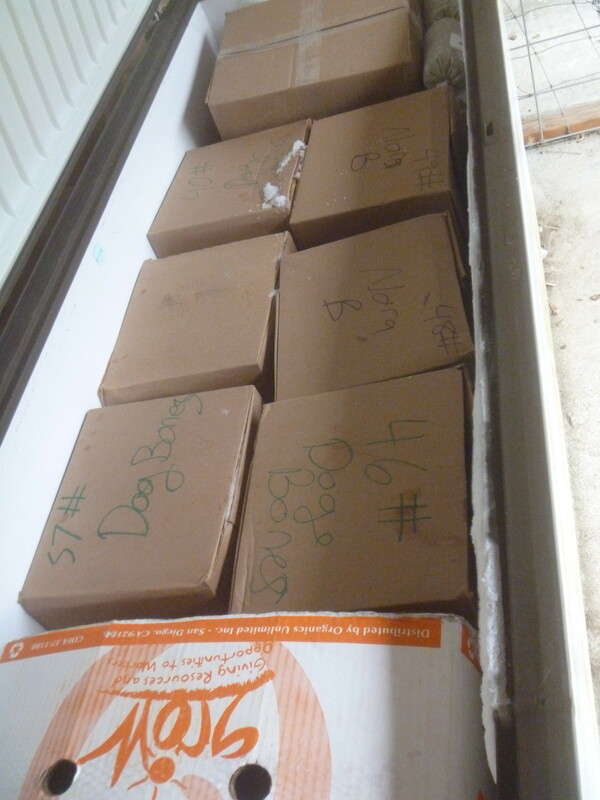 Yesterday, we picked up the last 400 pounds of bones that we will get and there are no more scraps. The butcher will no longer be processing the deer from the hunters as he has gained bigger contracts. I loved getting the meat from him because it was obviously organic. This freezer – which sits outside the back door under cover, I purchased from Craigslist for $50 makes it possible to store so much meat. Today was a day for resting and reading, restoring the body and soul We also had a bit of thunder, heavy rain and beautiful sunshine. The sun and rain alternated throughout the day. 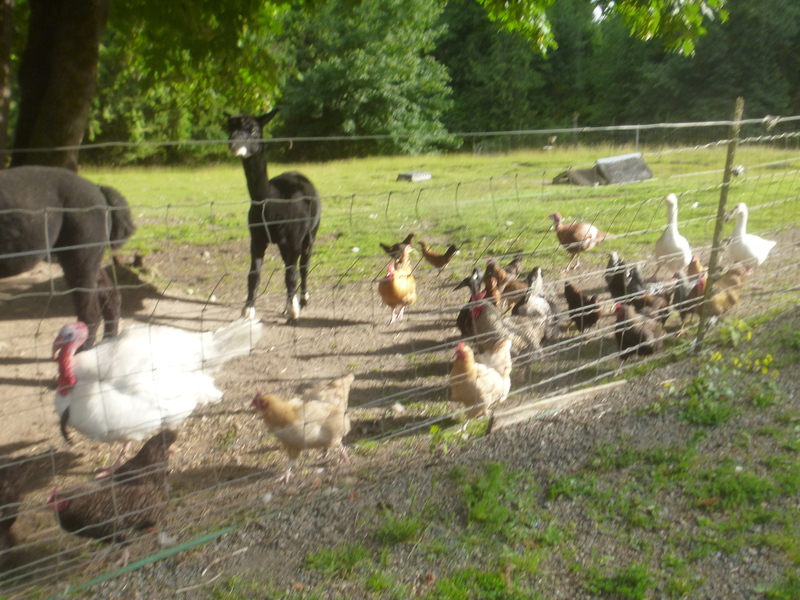 When evening comes the outside residents are waiting for us to open the back door. They come running to the place where they can join us on our walk down to the night time quarters – they, on one side of the wire, we on the other side. I feel like part of a parade. 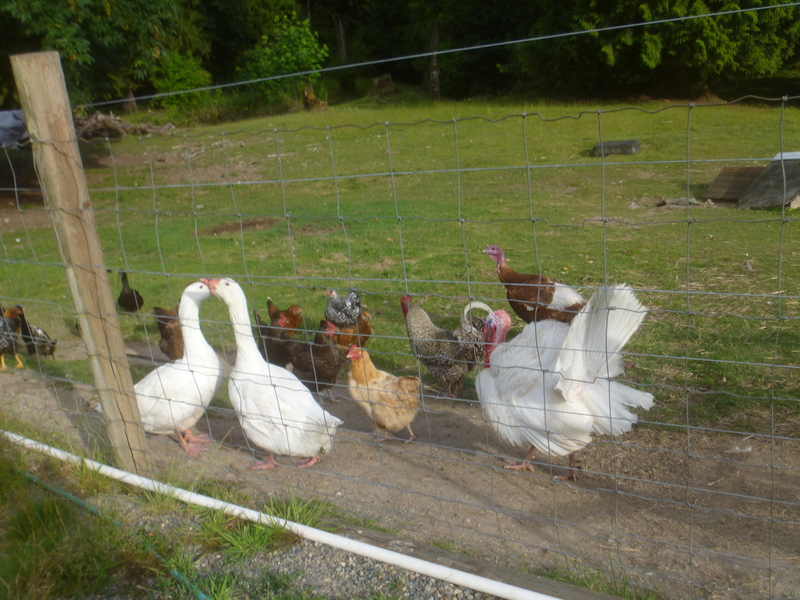 They run inside their own pens for a night time treat and to be locked safely away from predators. And we go back into the our house ready to end another day. 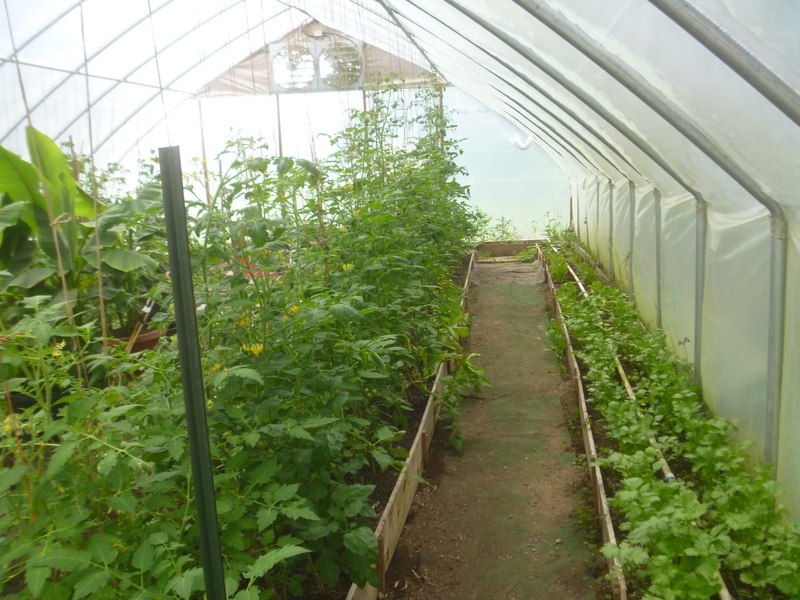 On the right is celery and our new crop of lettuce. 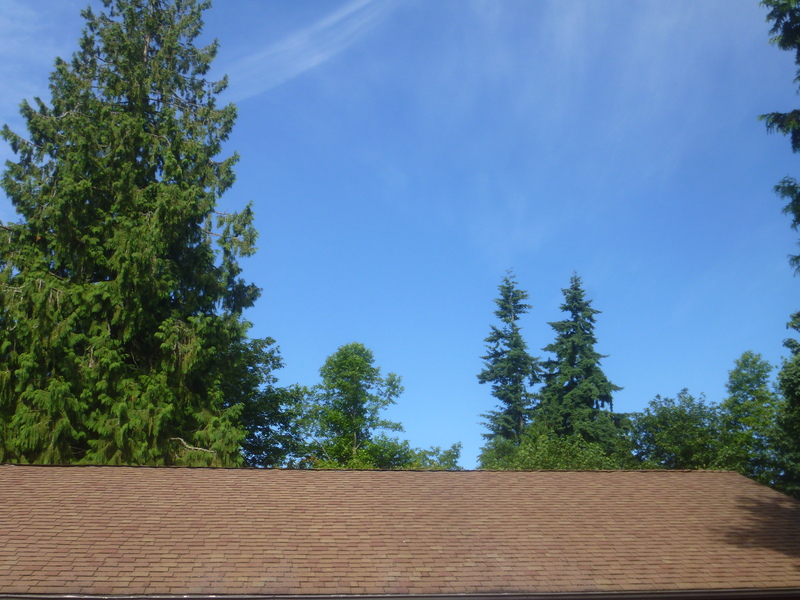 On the left the volunteer tomatoes reaching for the roof. 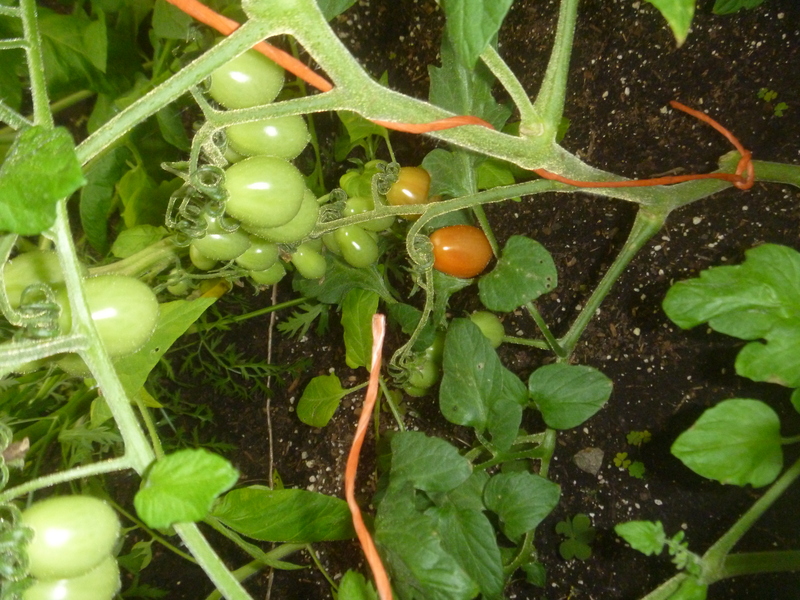 These volunteers are producing an ample supply of small tomatoes. So next year, I will not keep any volunteers from this side of the greenhouse. I promise to be ruthless on this. 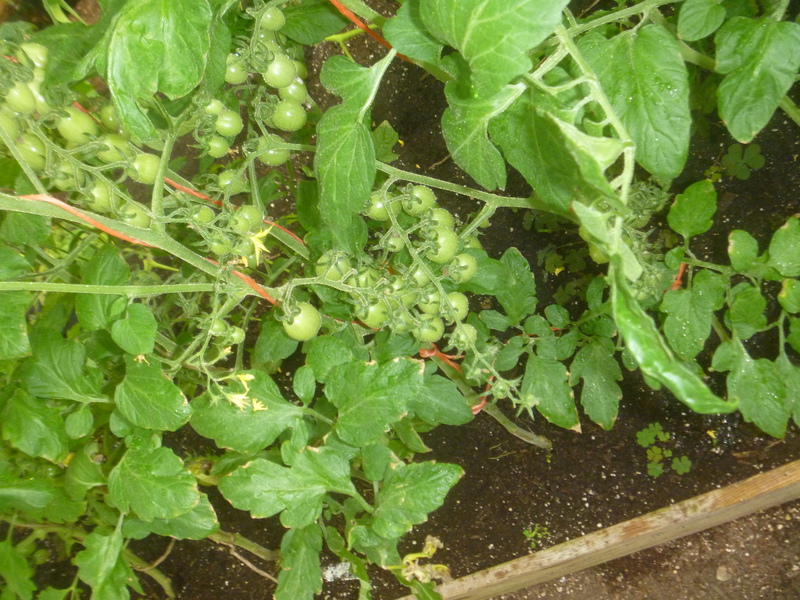 I put volunteers in the outside garden as well, so I may be picking many cherry size tomatoes. 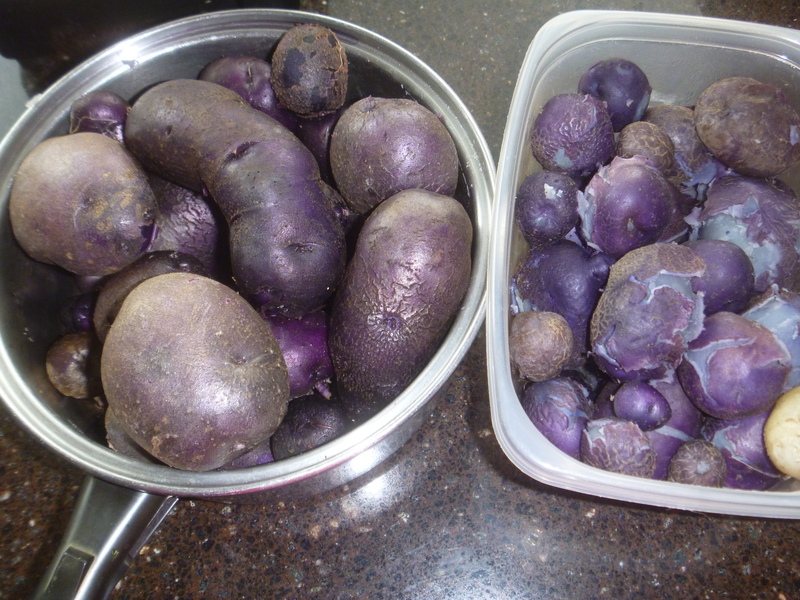 Here you can see that some are getting color which means it won’t be a lot longer until we can start enjoying them. 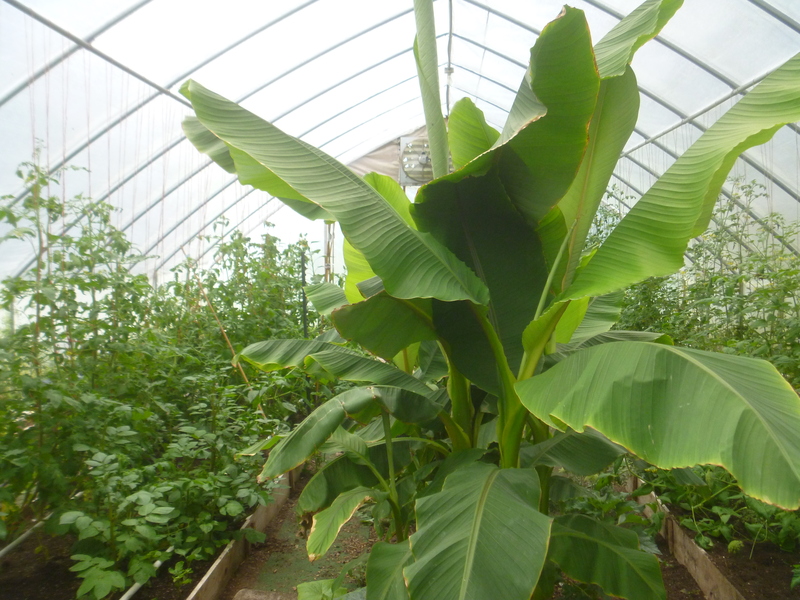 The banana plants would also like to go to the roof. And they are getting packed in their planters with lots of new starts all around them. I need to read up on them and see what to do next. I’m hoping to bring at least one in the house this winter and put a light on it. I wonder if I’ll get any bananas. It would be fun! Here is a shot from the far end facing the bananas. With tomatoes on both sides of this aisle and a few peppers as well. The plan is Sunday to put some beets and carrots where the potatoes were. Hopefully you enjoyed this wee tour. 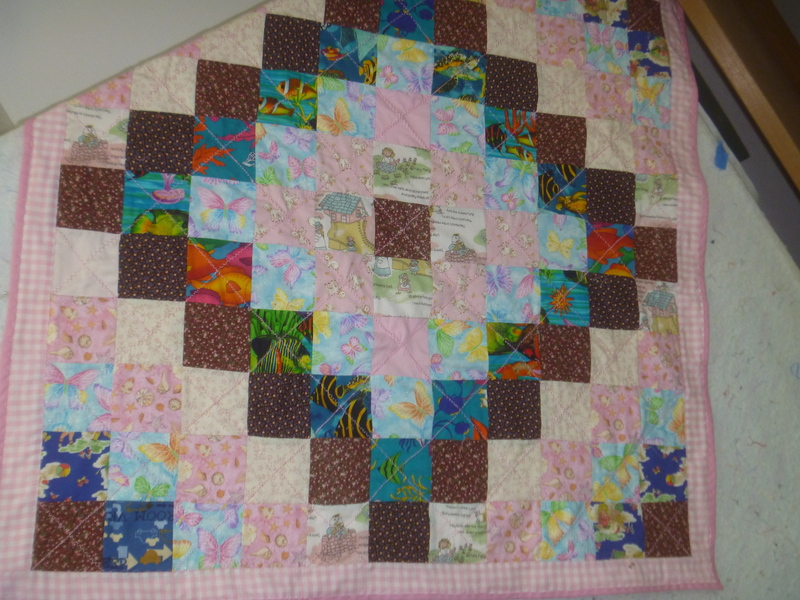 After cleaning a bit outside and contending with Internet Explorer issues, I finished the corners in this little quilt that had been patiently waiting. Next I finished the baby blanket that I worked on last week. I only put flannel in the middle layer and after finishing, I wished that I had used fleece to make it usable a bit longer as it is quite light . 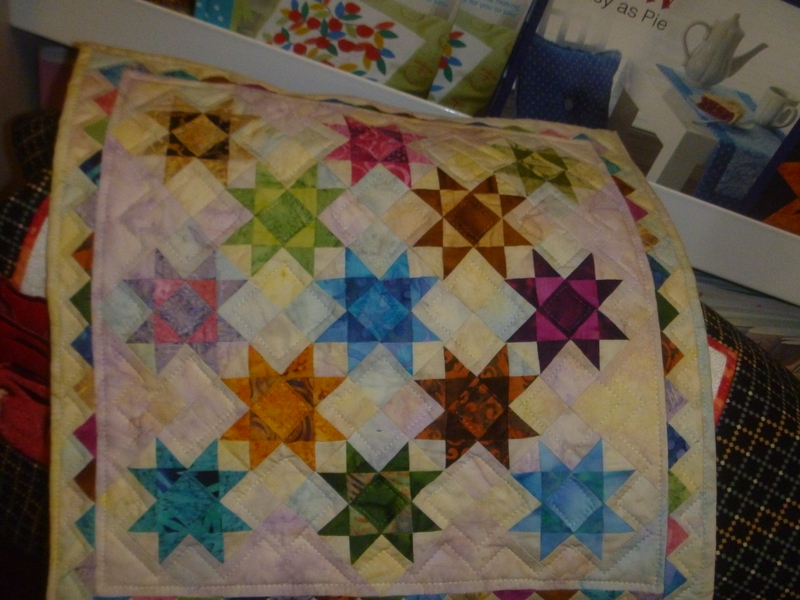 I used some of the sewing machine fancy stitches to quilt it on the diagonals. 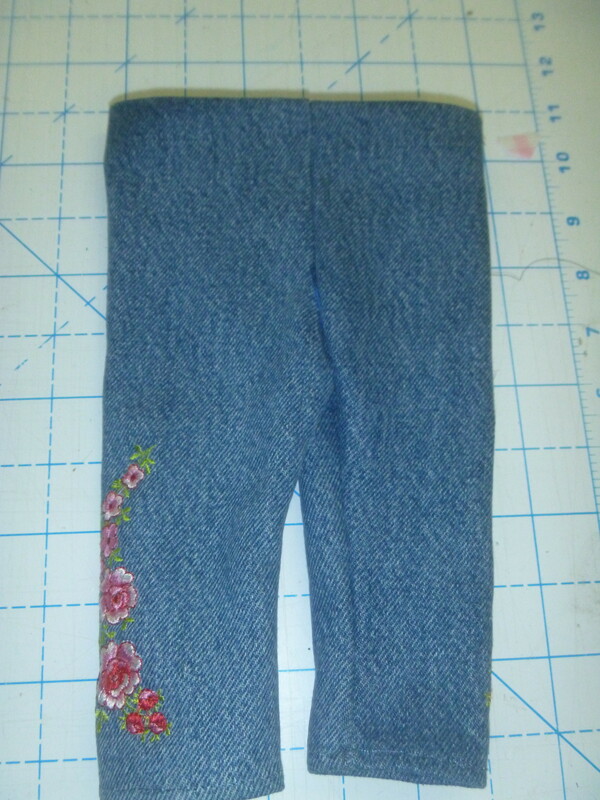 I hemmed 2 pair of doll jeans and make the casing for the waist. Now I just need to measure the dolls and put in the elastic. Some of these projects don’t take long, they just take “getting to them”. 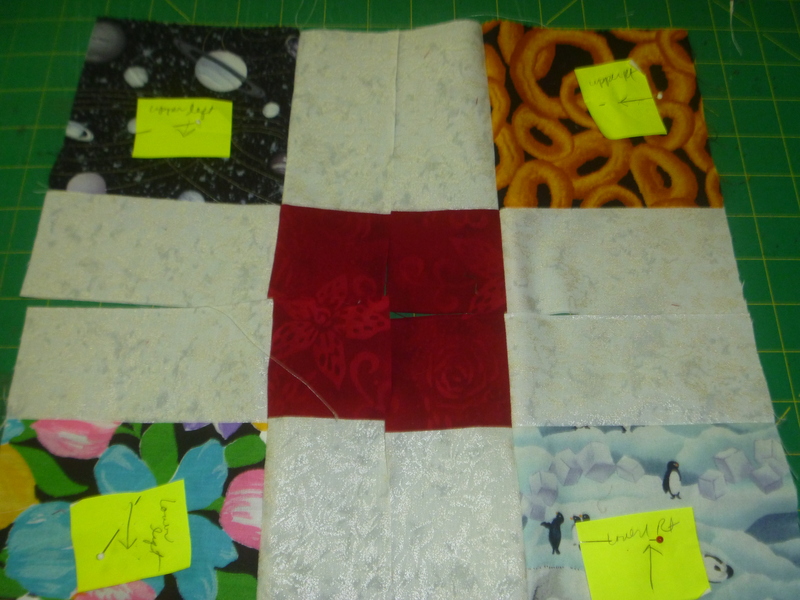 Then I couldn’t help it, I just had to start another project Earlier this year, in anticipation of this project, I had ordered a “layer cake” which is several cuts of 10″ square fabric. There were 40 different prints in this package, but I needed nearly 90. 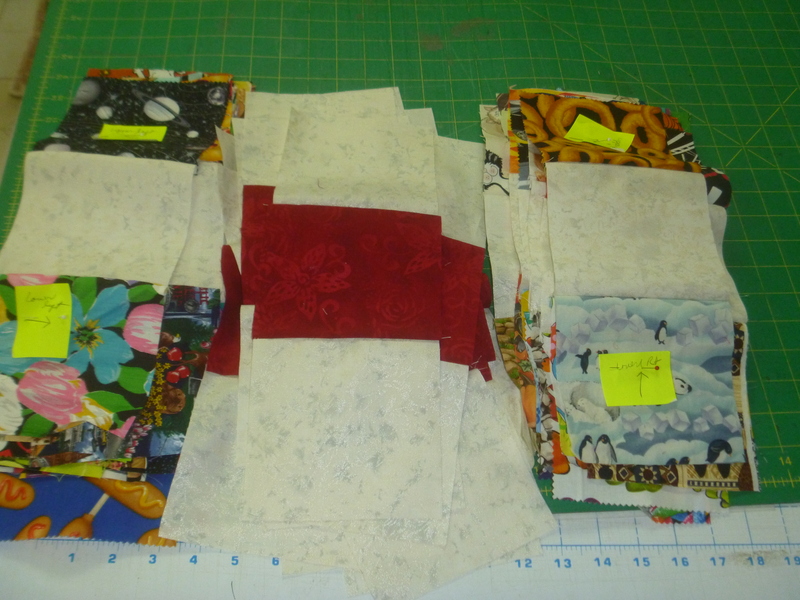 So I went through scraps, fat quarters, and my larger pieces, hunting for more pieces. 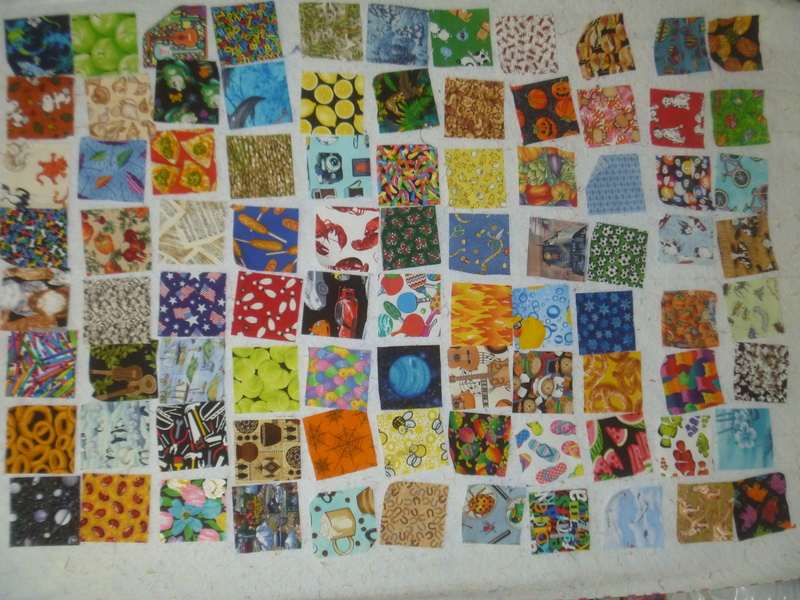 In an “I Spy” quilt, I like every print to be different to make it a bit more challenging. This is what really took most of the afternoon. 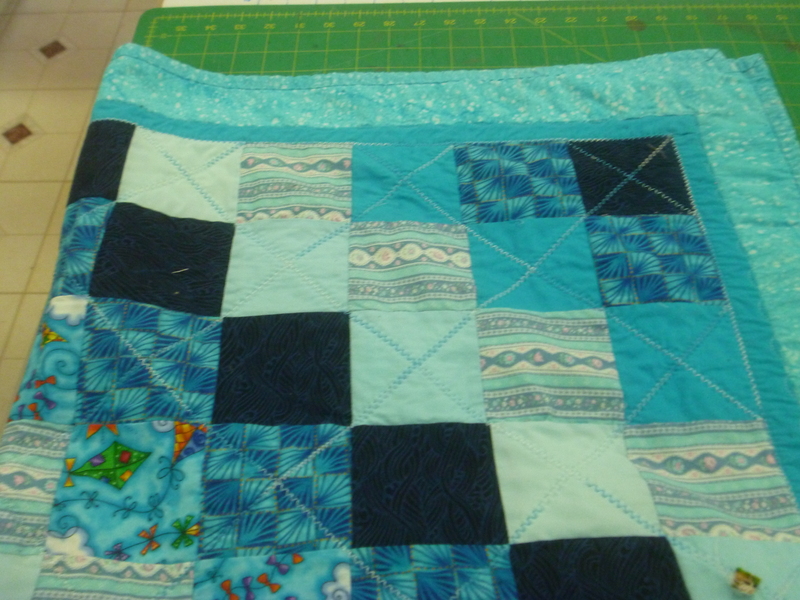 The quilt is now cut out except for the backing and binding AND the cutting table is cleaned off. There is a lot left to do and I will show you as I put it together. 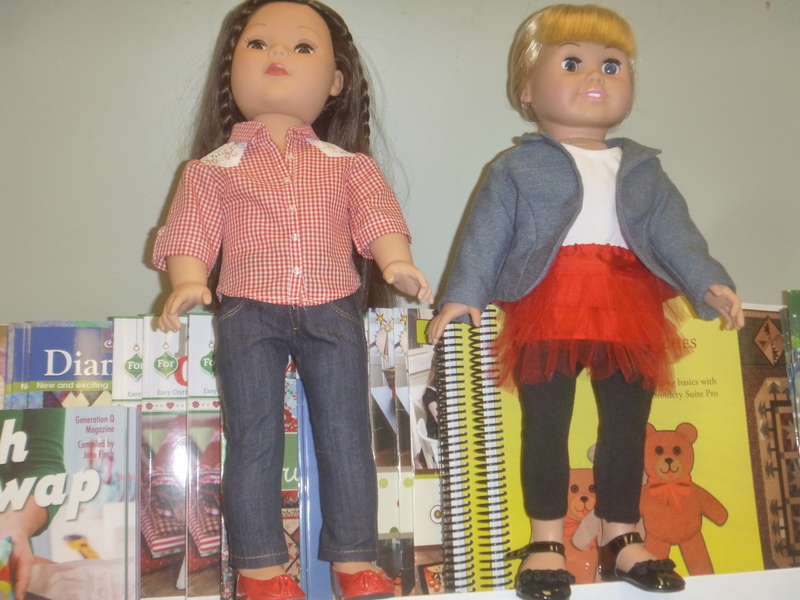 A great program today started with some darling 18″ doll outfits. 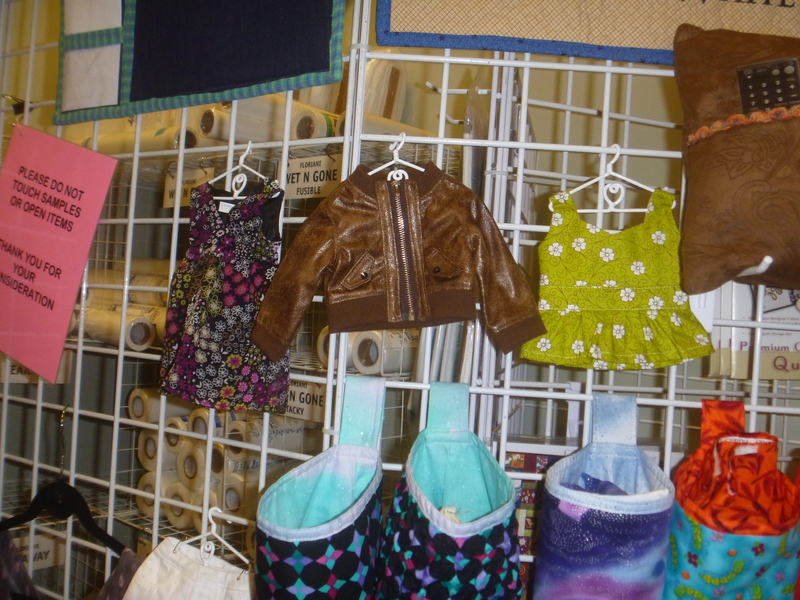 All of these are Liberty Jane Patterns. 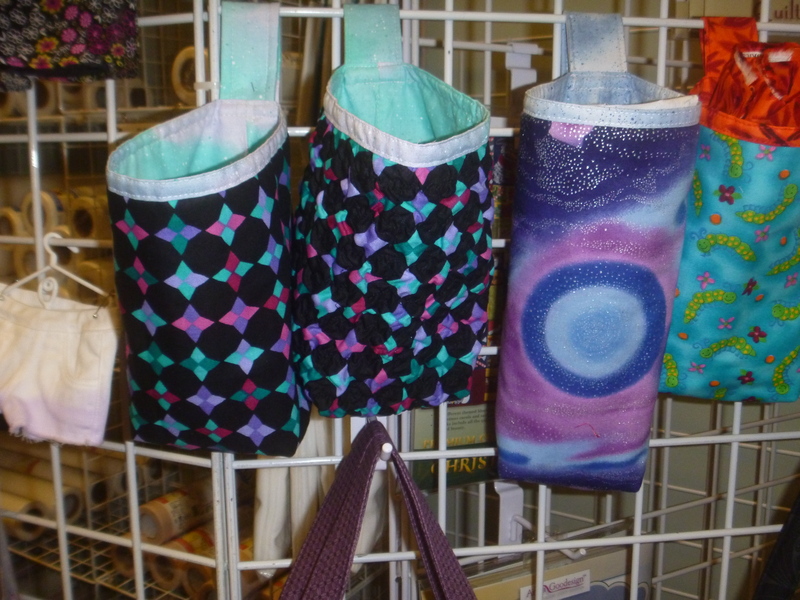 There were different bag patterns by Pink Sand and one of the women there had a bag she had just made from another of their patterns. She said the instructions were super easy to follow. There were some clothes patterns offered as well. And look as this little beauty was in the “show and tell” section. It was about 18″ across. That’s a lot of tiny work. It was a good infomercial this month. Something exciting and new here this morning. I put 5 cups of water with 3 cups of washed whole grain rice in a dutch oven with lid, then 2 cups of washed dry red beans with about 3″ of water in another pan with a lid in the oven at 350 for an hour. ( I did have to add more water when I checked the beans). I also needed to add half an hour to that. I was happy with the results of both. How convenient not to have to soak the beans or worry about them running over and since both could be cooked at the same time, I saved oven energy. Next time I will up the temperature to 375 and see if that cuts the time a bit. As soon as the vet office was open we made an appointment for Lacey. who was supposedly due in two weeks. She has not eaten for the last 3 days. So off we went with her. No, she is not pregnant AGAIN. I’m guessing she knows I have homes for some puppies. (LOL) But she did have a fever, so we left her there for blood tests and will find out more when the results come back. I found these interesting small – 3″ diameter – tortillas at the store last week and we were out of chips. I toasted these for about 3.5 minutes and they formed little pockets. That was unexpected and very interesting. Since I made a Costa Rican dish, Gallo Pinto, we put it in the pockets and ate it that way – very delicious! We did top it with tomato salsa when we ate it . In Costa Rico, Gallo Pinto is served for breakfast, lunch, and dinner. If you haven’t tried it, you’ll be surprised how delicious a simple dish can be. All you’ll need to add is a salad. It freezes well also. So I like to have it on hand for a quick meal. mix and heat throughout. Serve. Google has Lizano salsa which we have not found in local stores It’s ingredients include: water, sugar, salt, onions, carrots, cauliflower, cucumbers, spices, pepper, mustard, and turmeric. The outside gardens have finally been fertilized. I know I would have more success if I’d get things done in a more timely manner. It seems other things keep getting in the way. This is only the second time this year I’ve fertilized, so I’m hoping all the composted manure from last year that we put in the beds is still effective. This fall we will put in a cover crop as the ground is heavy with clay and perhaps that will help break it up. I love multitasking. 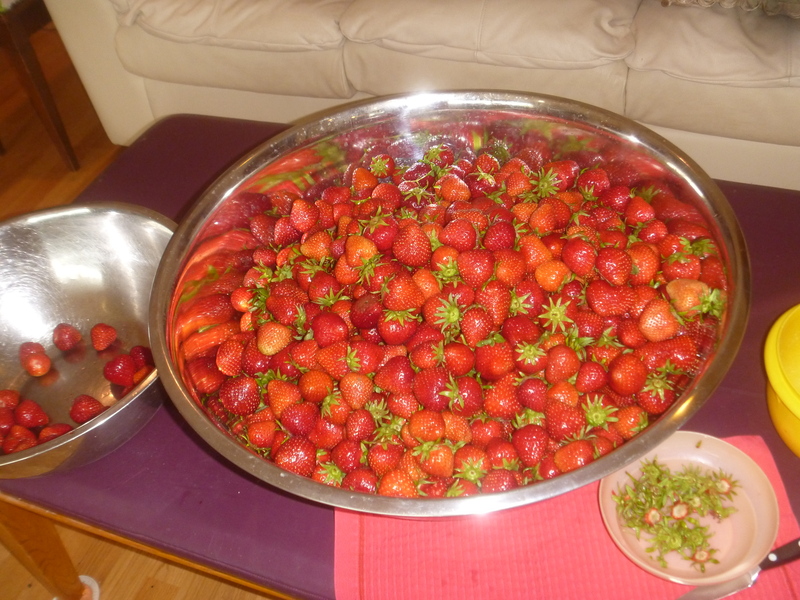 The clothes were being washed, the beans were cooking while I was finishing the strawberries. Aw the wonder of modern conveniences. See my helper peeking out from under the right side of the table. He enjoyed watching. When I got the camera out, he ran for cover. 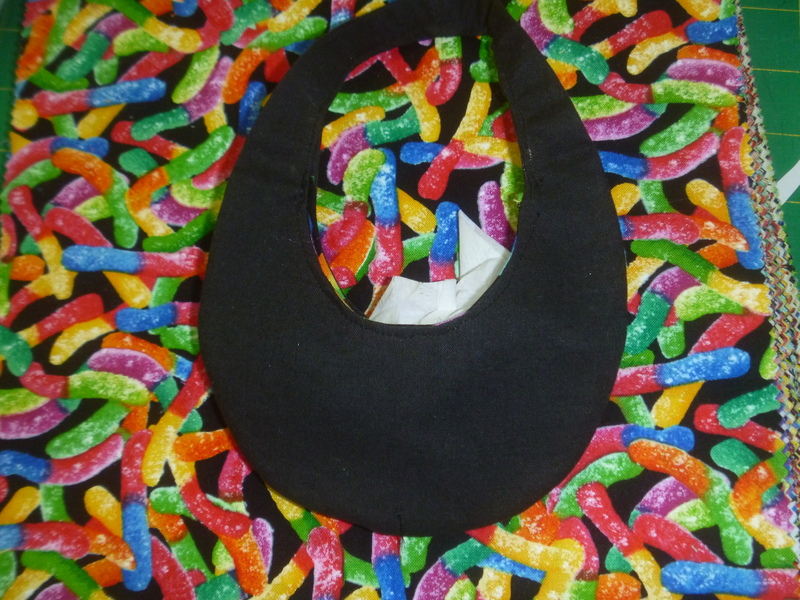 I was ready for a break so I made a hobo bag using this pattern for the dolls. The instructions are good with photos to go with it. They don’t take long so I’m planning on making more of these for Christmas gifts to gift with the dolls. And to make it even better, the designer will send you the “money” you can print out and put inside. 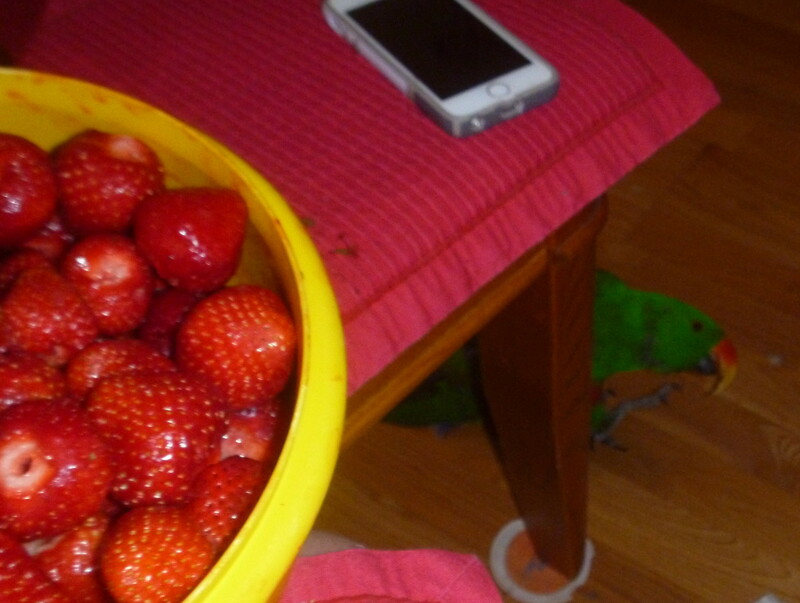 The counters are clean, the dishes done and the floors are clean from the strawberry marathon. Supper and relaxing time have arrived. 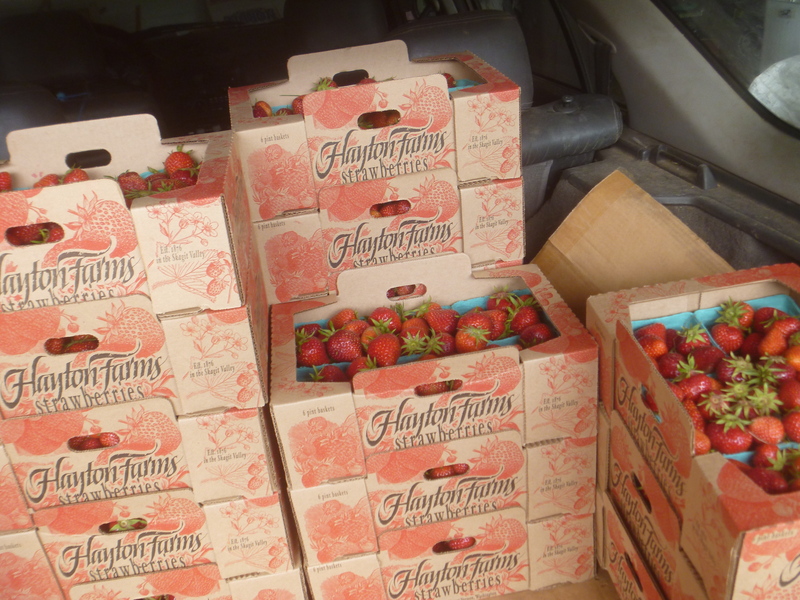 Having decided I have lots of energy (must keep telling self this), I ordered 150# of the best organic strawberries. 150# is 15 full flats. We picked them up at 10 this morning and have been working on them. I washed and stemmed and he cut and packed into the vacuum bags. We did take a quick lunch break and then right back to working on the berries until 6 this evening. We now have about 110# in the freezer, vacuum packed in smaller quantities. The rest are either in our stomachs or in the refrigerator waiting until morning. I’ll put 4 batches in the freezer with just the quantity for the jam recipe. That will probably take most of the rest. I’ll leave a few out for eating. These will be oh, so good, this winter and will remind us that summer will soon be here again. First I must share the beautiful sky we had today because it’s not often like this. 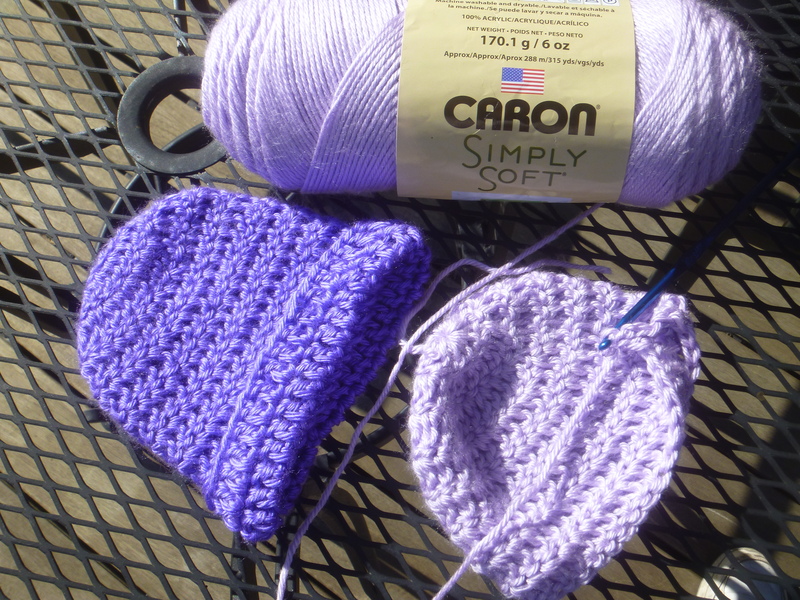 My husband is crocheting these little purple hats for Mary Bridge Children’s hospital in Tacoma. The national goal is to send every new baby home with a purple hat and a 7 minute video on why one should not shake a baby. If you know how to chain stitch and how to do a double crochet (dc) this might be a charity project you would consider. (and if you are interested and don’t know how , you can go to YouTube like I did) You could even make one for yourself with a larger hook and yarn, using the same number of stitches. .
dc in every stitch around and close circle.